Fluornatromicrolite: Mineral information, data and localities. Named after the chemical composition. It was first approved as a new species by CNMMN, IMA in 1998 (IMA1998-018). But at the time the name was given, although approved, it was not according to the nomenclature at the time (Hogarth 1977). Cause to controversies about the mineral and the nomenclature of the pyrochlore supergroup, the publication was delayed for several years. It was first published by Witzke et al. (2011). Now the name is approved according to the new nomenclature of the pyrochlore supergroup (Atencio et al. 2010). 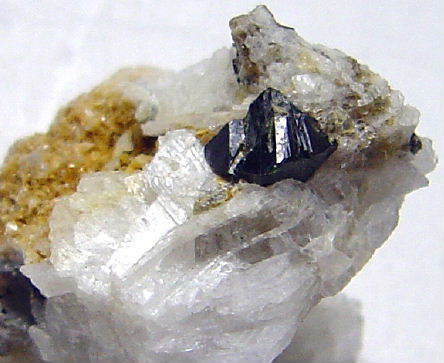 A sodium-dominant mineral of the Microlite group with fluorine dominant at the second anion site. Calculated density for Z=8 is 6.568g/cm�. The difference betwen the calculated and the measured density may be due to the small quantity of the mineral used. 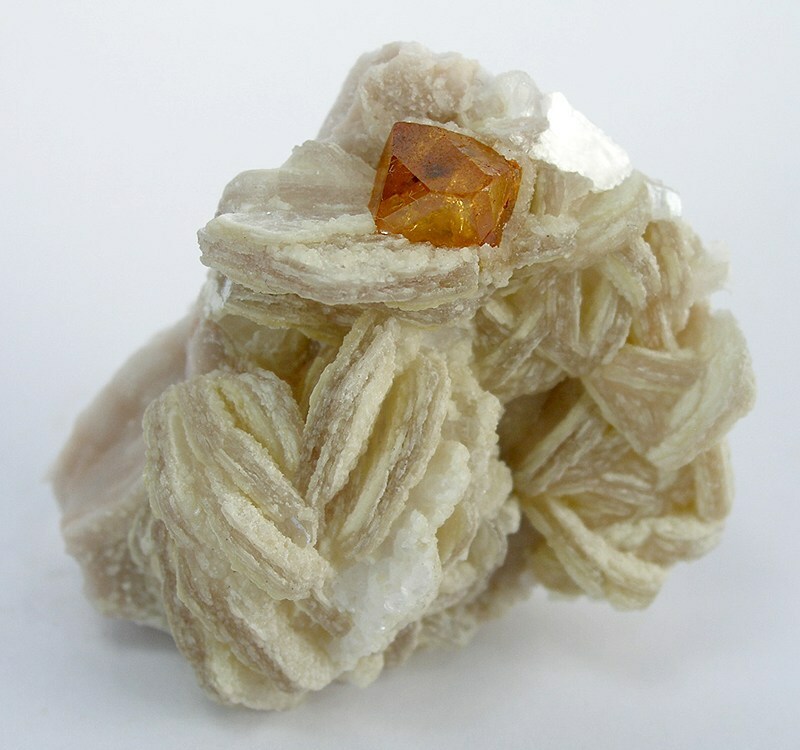 In the Mineralogical Collection of the Bergakademie Freiberg, Germany (No. 77975) and in the Mineralogical Collection of the Martin-Luther Universität Halle, Institut für Geologische Wissenschaften (No. 010356). Muscovite 13 photos of Fluornatromicrolite associated with Muscovite on mindat.org. Albite 11 photos of Fluornatromicrolite associated with Albite on mindat.org. Cleavelandite 11 photos of Fluornatromicrolite associated with Cleavelandite on mindat.org. Topaz 8 photos of Fluornatromicrolite associated with Topaz on mindat.org. Quartz 5 photos of Fluornatromicrolite associated with Quartz on mindat.org. Schorl 4 photos of Fluornatromicrolite associated with Schorl on mindat.org. Orthoclase 2 photos of Fluornatromicrolite associated with Orthoclase on mindat.org. Tantalite-(Mn) 2 photos of Fluornatromicrolite associated with Tantalite-(Mn) on mindat.org. Hafnian Zircon 2 photos of Fluornatromicrolite associated with Hafnian Zircon on mindat.org. Microcline 2 photos of Fluornatromicrolite associated with Microcline on mindat.org. 4.DH.15 Bismutopyrochlore (of Chukanov et al.) (Bi,Ca,U,Pb)2-xNb2(O,OH)6(OH) Amor. 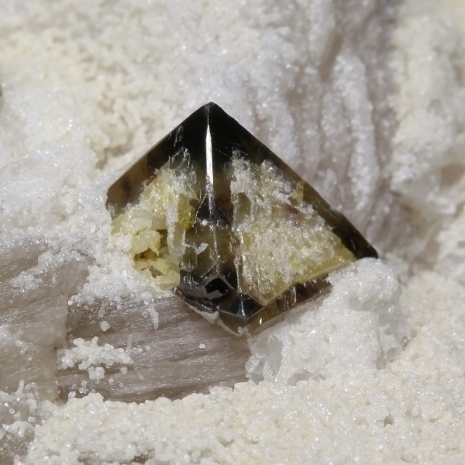 Witzke, T., Steins, M., Doering, T., Schuckmann, W., Wegner, R., and Pöllmann, H. (2011) Fluornatromicrolite, (Na,Ca,Bi)2Ta2O6F, a new mineral from Quixaba, Paraíba, Brazil. Canadian Mineralogist: 49: 1105-1110. The following Fluornatromicrolite specimens are currently listed for sale on minfind.com. Novák, M., Ertl, A., Povondra, P., Vašinová Galiová, M., Rossman, G. R., Pristacz, H., ... & Škoda, R. (2013). Darrellhenryite, Na (LiAl2) Al6 (BO3) 3Si6O18 (OH) 3O, a new mineral from the tourmaline supergroup. American Mineralogist, 98(10), 1886-1892.